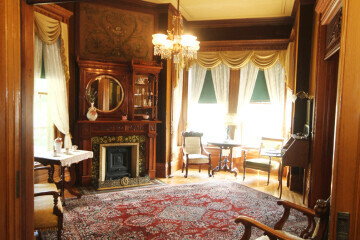 The Cook-Rutledge Mansion, listed in the National Register of Historic Places, is one of the finest examples of High Victorian-Italianate architecture in the Midwest. Extraordinary hand-painted ceilings and walls, ornately carved woodwork, parquet floors, handcrafted silver doorknobs and hinge plates, and crystal chandeliers enhance the beauty of the interior. The grand staircase of carved golden oak provides an elegant setting for the cathedral stained glass window on the landing- Adults $5, 18 and under $1.